Toto may not be a band that comes to mind when one thinks of the legendary Montreux Jazz Festival, but back in 1991, they were there, front and center. They would make a return appearance in 2015. Quincy jones had always been a fan of Toto and he invited the band to appear. The core members of the group at the time were Steve Lukather, David Paich, Mike Porcaro, and Jeff Porcaro. Jeff would pass away shortly after their performance and Mike followed in 2014 before their return to the festival. Toto is mainly known for their series of melodic rock hits during the late 1970’s and early 1980’s that featured tight harmonies. Songs such as “Hold The Line,” “Rosanna,” and the number one “Africa” sold millions of copies and made the band a consistent concert draw. Down through the years Toto has been a musically consistent bad. One album flows into another and if you like one, you will probably like them all. That is what makes their set at Montreux so interesting. “Rosanna” and “Africa” are both there but the rest of their performance digs a little deeper into their catalogue, plus they stretch out a bit and cover some songs not usually associated with their style. They take on the Jimi Hendrix classic “Red House” and Sly Stone’s “I Want To Take You Higher” and while the originals may be preferable, the energy is there and it is interesting to see and hear the band outside their comfort zone and taking some chances. The CD and the DVD contain the same song set. Both the sound and video are excellent as they have been remasterd with modern technology. The booklet gives a succinct history of their performance. 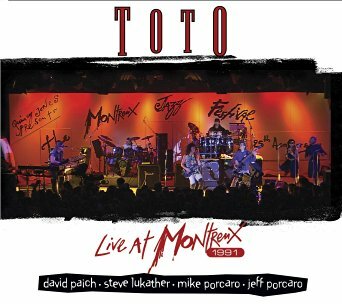 Live At Montreux: 1991 is a nice addition to the Toto legacy and should please any fan of the band.